Brendon Rockey ran his fingers through crumbly soil on a warm August morning, kneeling in the same dirt his father and grandfather farmed before him. 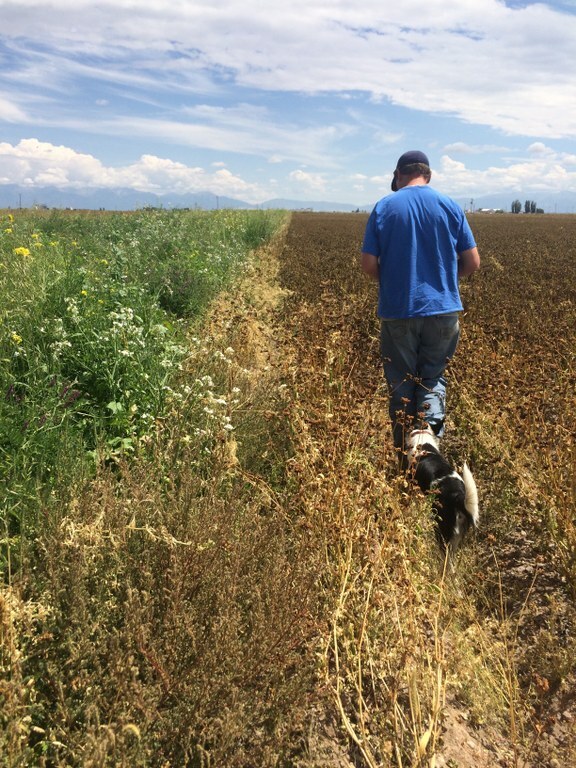 The mostly edible medley growing underfoot – 16 different vegetables, legumes and grasses in all – will never make it to market for this Colorado farmer. Instead, Rockey will leave these crops to decompose in the earth, their remains creating a nutrient-rich soil he hopes will grow better potatoes next year, all while using about two-thirds less water than a typical potato crop. 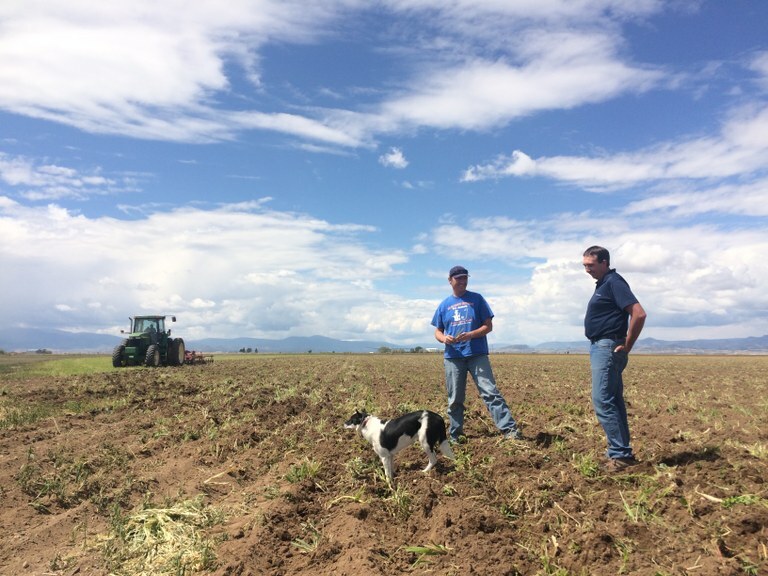 Brendon (left) and Sheldon Rockey (right), stand in a portion of their Center, Colorado, field where they planted a mix of vegetables, legumes and grasses, known as cover crops, to enhance the soil’s ability to hold water. 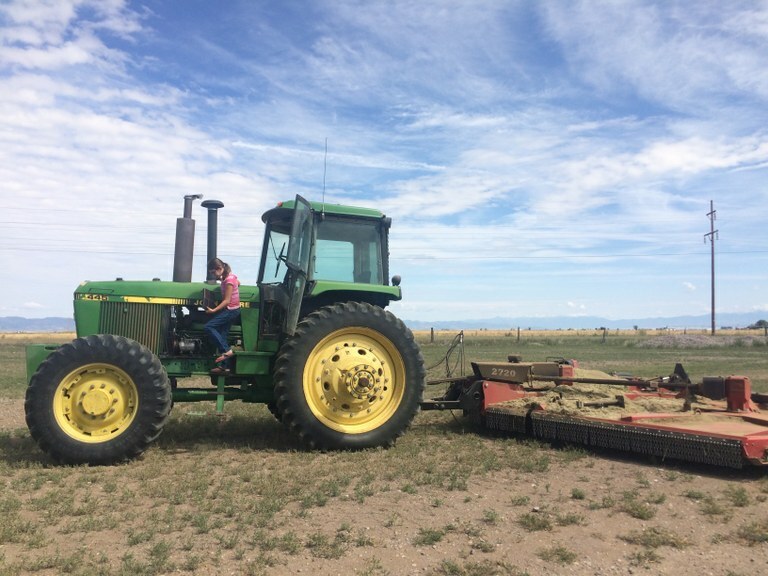 Among the myriad strategies farmers in Colorado’s San Luis Valley have attempted during a decade-long, soil-wracking drought is planting cover crops: efficient plants that enhance the soil’s ability to hold water. Cover cropping has helped Rockey slash water use by 40 percent and eliminate synthetic fertilizers. “It’s all about building a resilient system that takes care of itself,” Rockey said of his business, Rockey Farms, which he operates with his brother, Sheldon, 41. The Rockeys’ cover crop mix includes legumes that pull nitrogen from the air and store it in the soil, allowing the brothers to create nitrogen-rich fields without dousing them in chemicals. More organic matter in the ground, like decomposing roots of the cover crops, makes better soil; better soil needs less water; less water means more valley farmers can sustain their livelihoods. More farmers here are adopting the practice, said Samuel Essah, an associate professor with Colorado State University’s San Luis Valley Research Center. It’s a model that, in theory, could work for bigger operations. Even so, cover crops are used on only about 1 percent of farmland nationwide, according to the U.S. Department of Agriculture, though the trend is increasing. The sparse uptake is partly due to economics: Cover cropping requires part of a farm to go out of production each year, growing fewer cash crops and, in turn, generating less revenue. And the transition doesn’t happen overnight. It took several years for the Rockeys to see the kinds of soil benefits that saved them money – a tough sell to banks that expect a loan payment every year. In some ways, the Rockeys are poster children of the San Luis Valley, a largely agricultural region the size of New Jersey flanked by mountain ranges and home to about 45,000 residents. Their grandfather established the farm in 1938. Today, four generations later, the Rockeys’ children are growing up in the fields. On a recent morning, Ellaree Rockey, 10, drove a tractor the size of a mobile home. But a few things set Rockey Farms apart. For one, they plant cover crops on half of their 500 acres, instead of just a fraction of their operation, each year. Ellaree Rockey, 10, steps down from the tractor she was just driving across her family’s farm. They’re also experimenting with more diverse cover crops than other farmers. Whereas some farmers in the San Luis Valley rotate potatoes with a single crop – one favorite is a grass called Sorghum Sudan – the Rockeys plant a 16-species mix. Instead of spraying insecticides or other chemicals, the Rockeys plant flowers to attract insects that eat disease-carrying bugs – a practice unrelated to their water-saving efforts, but important to controlling viruses. The Rockeys didn’t always farm like this. Though their family has always been innovative – their uncle, a former missile range worker with a Ph.D. in physics, experimented with injecting ozone into irrigation water, a practice the Rockeys still use – until recently the Rockeys farmed much like their neighbors, rotating potatoes and barley, irrigating their crop circles with sprinklers the length of football fields. But, fighting against hard and compacted soil, they turned to cover crops, whose root systems break up the ground and create pores for rainwater to infiltrate into the dirt. Cover crops were also an alternative to barley, which hosted a fungal disease that harmed their potatoes. Their uncle had read about the practice, and in 2000 they decided to give it a try. Brendon Rockey walks through his family’s potato field next to a long strip of flowers he planted to attract beneficial insects that help prevent disease. Then, water got scarce. A multi-year drought starting around 2002 shrank the region’s water table, drying up wells and forcing farmers to take some acres entirely out of production. Growing a field of barley takes about 20 inches of water, according to the San Luis Valley Research Center’s Samuel Essah. A crop of Russet potatoes typically needs about 18. Only about seven inches of rain fall in the valley each year, so farmers pump the rest from their shared aquifer. The Rockeys say their soil’s improved water retention has allowed them to grow potatoes using just 14 inches of water, instead of 18. The 16-species cover crop mix needs just six inches to flourish, cutting their overall water use by about a third. The benefits of cover crops are more than just anecdotal. Studies have shown that cover crops improve soil, slow wind erosion, help control pests and weeds and, in some cases, even improve yield. A survey by Sustainable Agriculture Research and Education of more than 700 Midwestern farmers in 2012, for instance, found corn planted after cover crops had a 10 percent higher yield than adjacent fields without cover crops. The survey found that yields were even higher in areas hard-hit by drought. The Rockeys farm a special kind of potato called fingerlings, a niche product that draws up to three times the price of a mainstream potato, like the Russet. That’s a potential problem for transporting this strategy to bigger farms. Although some large-scale farmers have pioneered the practice in other regions, using other crops, it’s unclear whether potato farmers with slimmer profit margins can take half their farm out of production each year, like the Rockeys have, and still make ends meet. Cover crops need water, too, a turnoff for some farmers whose water supplies are already limited, said Rudy Garcia, a soil health specialist for the National Resources Conservation Service. A Texas A&M study found multi-species cover crop mixes, like the blend that the Rockeys use, require the most water of any cover crop studied, but also create the most soil-fueling biomass. For the strategy to work, the water savings from healthier soil have to outweigh the water a farmer uses on the cover crops themselves. And that might not be the case for everyone: research suggests the benefits of cover cropping are highly site-specific, and can vary widely. For the Rockeys, eliminating synthetic fertilizer and reducing water use is not just about yielding a better crop. It’s about ensuring the future of their community by naturally improving soil and reducing water use. Their father, after all, was the first to warn the Rockey boys about drought as they grew up in the 1980s. Even then, he saw the future of the valley irrevocably tied to the future of its water.